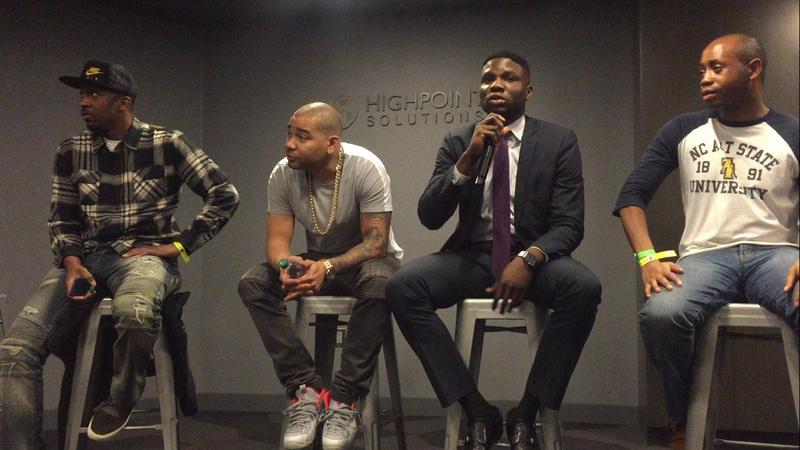 Luke Lawal Jr., DJ Envy And More Discuss HBCUs at the Barclays Center - Luke Lawal Jr. The Brooklyn Nets v. Charlotte Hornets basketball game at the Barclays Center in Brooklyn, New York was no regular basketball game. During the game, and before, the historically black college and university (HBCU) community was vividly in the building. HBCU t-shirts, jackets, and banners decorated the arena. Not only were HBCU alumni invited to the game for a package deal, they were offered entry into the billboard lounge, with food, drink, and entertainment, and to a host of networking opportunities. HBCU Night also featured an all-male panel, speaking to a group of about fifty all-male Brooklyn high school students and their fathers. Seats on the panel were shared by Hampton University pirate and celebrity disk-jockey, DJ Envy, Bowie State Bulldog and HBCU Buzz CEO Luke Lawal, North Carolina A&T State University Aggie and CBSN Live Associate Producer Dexter Mullins, and Theo Brown of Atlantic Records. Panelists embraced a relaxed, informal atmosphere, encouraging the young men to find and pursue their passion while motivating the group towards college, specifically the historically black environment. DJ Envy told a personal story about him almost going to jail, sharing that after praying to God, and after a weapon he touched was found without fingerprints, he was able to have clarity about his future decisions, from almost losing his future. DJ Envy and also shared that one reason he wanted to pursue higher education was premised on him wanting to be wealthy, having the opportunity to provide for his family. “NEVER EVER GO IN A ROOM WITH SOMEBODY THAT YOU WANT TO BE AND BE AFRAID TO TALK TO THEM..BE AGGRESSIVE IN TRYING TO FIGURE OUT HOW YOU CAN GET THERE”. Associate Producer Mullins told students “even if you don’t have the best grades, and if you messed up, don’t be afraid to apply to a college, especially an HBCU” and “nothing is going to go the way you want it to ..ever, so it is important to have a plan A, and plan B and a plan C”. Correspondent and America’s Next Top Model finalist Bianca Golden, who was moderating the evening, chimed in, expressing her Lincoln University Lion pride. A heartfelt story about her loved ones missing out on the joys of life resonated with the young men as they sat in silence, with wide eyes, listening to her as she pleaded them to take control of their lives. “Being a part of something is important… [and] changing the path that you are on right now is important, though it may not seem cool when you are on the block, you can’t make any excuses like oh my mom wasn’t there, or like my parents didn’t have time for me”. After the panel, the students were afforded the opportunity to take pictures and have a one-on-one time with the panelists, if desired, along with tickets to the basketball game. HBCU Night was a success, as the students left knowing more than they came knowing, and because they had the opportunity to see that no matter the industry, black men can shake the stereotype, and prosper.